ORAL MANIFESTATIONS OF HEPATITIS C VIRUS. Department of Conservative dentistry and oral pathology, Faculty of Dental Medicine, Medical University, Varna, Bulgaria. Hepatitis C virus (HCV) infection is a serious public health problem. New infections continue to occur, and morbidity and mortality are increasing. The date reported that 3% of infected world population are affected. Morbidity associated with hepatitis C virus infection can involve a variety of extrahepatic conditions including the oral region. Some of the oral manifestation are oral disease like lichen planus and Sjögren-like sialadenitis , other affects the dental status, and side effect of the virus therapy. The aim of this review is to summarize the oral sings, accompanying hepatitis C virus . Panov VE. Oral manifestations of Hepatitis C virus. J of IMAB. 2013; 19(4):377-379. doi: 10.5272/jimab.2013194.377. 1. Australasian Society for HIV Medicine, Dental and orofacial health and hepatitis C. ASHM, 2012. 15. Yarom N, Dagon N, Shinar E, Gorsky M. Association between hepatitis C virus infection and oral lichen planus in Israeli patients. 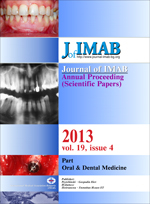 Isr Med Assoc J. 2007 May;9(5):370-372. [PubMed].